This website showcases a wide variety of computers and devices built around the RCA CDP1802 COSMAC microprocessor. The 1970s was an exciting time for computing. Engineers created new chips called microprocessors that contained the logic and number crunching ability of their much larger ancestors, and computers became personal for the first time. They no longer took up an entire room, and average people could afford them. It was all new territory, though, and few people knew what to do with these machines. Nobody had yet written the software to make them useful, and little existed in the way of standards. Some people viewed this as an adventure. Some even built their own computers, guided by instructions in electronics magazines of the day. 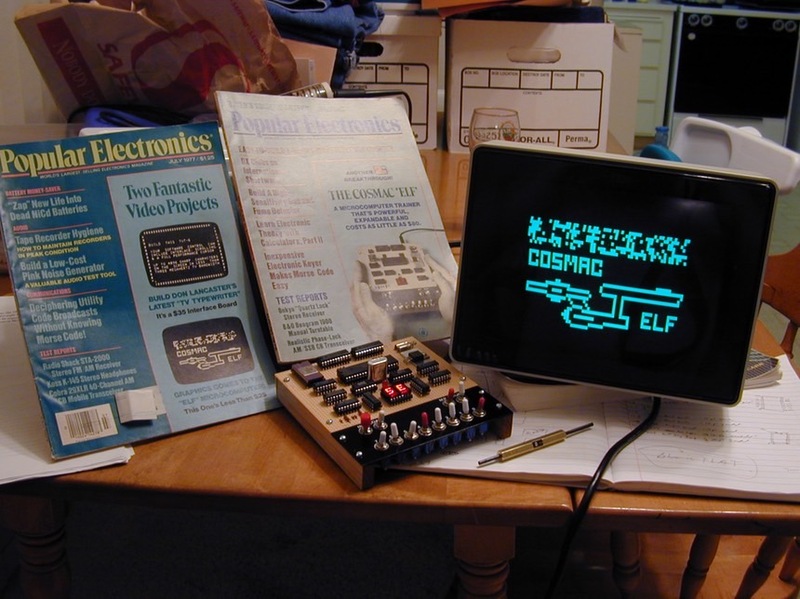 One of the simplest of these was the COSMAC ELF. "This microprocessor is so good that even RCA is not really aware of how good it is." This website illuminates some of the history of 1802-based computers, and hopes to share some of the enthusiasm found throughout the books, newsletters, and galleries archived here. For those who still enjoy tinkering with these systems, RCA/Intersil technical data and software is available, and an active community awaits you. Thanks for dropping by, and enjoy your visit!